A dish that is full of colour and flavour, guaranteed to be enjoyed by the whole family. Heat a glug of rapeseed oil in a large frying pan set over a medium heat. Add the onion and garlic and cook for about 5 minutes, until softened. Add the courgettes, tinned tomatoes, olives and sun-dried tomatoes and season with salt and pepper. Let everything simmer together for 3 to 5 minutes, until the veg are softened. 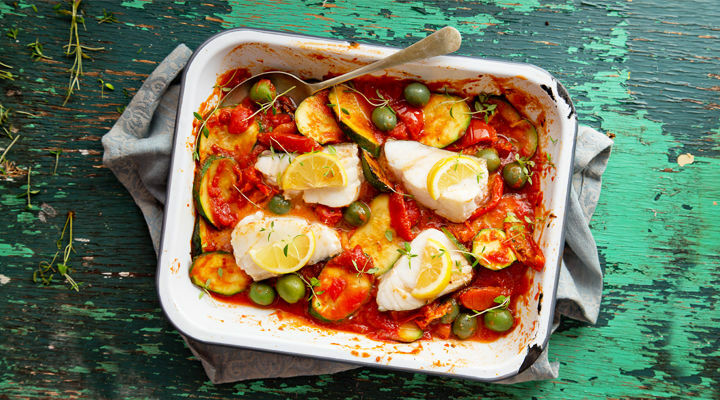 Transfer to a baking dish or tray and put the cod on top. Cut half of the lemon into four slices and put these on top of the cod, then squeeze over the juice of the rest of the lemon to bring out the natural flavour of the fish. Add a final drizzle of rapeseed oil across the fish.